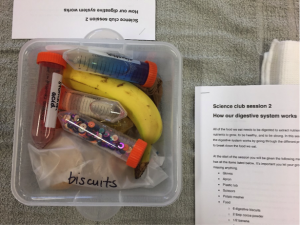 Week four of the science club was all about the children recapping on what they had learned in the previous weeks, and preparing materials for a show-and-tell with their families in week 5. One group practiced arranging the organs of the digestive system. They managed to get everything assembled correctly in under 5 seconds! They also prepared a poster on the gut microbiome. Working through how the digestive system works. 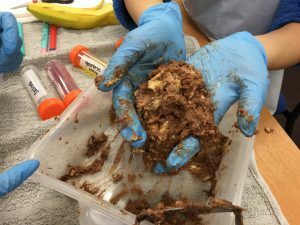 Edible poo will be required next week! We were really impressed with how much the children remembered from the first three sessions, and loved how enthusiastic they were to share what they had learned with others. They seemed to really like the idea of professional conference posters. This is something we will use with all groups for the next run of the after-school science club (June–July 2018). A lot of excitement from the kids and stress for me (Marine) the day of the farting session! 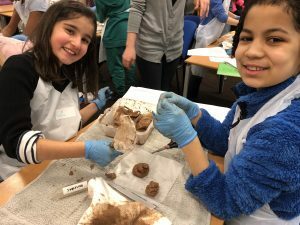 The session on how our digestive system works the previous week had been a huge success, so the pressure was on to make this session fun and to keep the kids motivated and engaged. Before the kids arrived, we prepared three “lab benches” with all of the materials for the experiments ready and waiting. Everything ready for the kids to conduct their farting experiments. To save time, all the dry ingredients had been weighed out in advance. The kids only had to pour the ingredients into the flasks along with the water. I deliberately placed the lab benches at the back of the classroom, so the experiments could be left to incubate without distracting the kids while I went through some of the theory behind the experiments and what they were going to show us. When the kids arrived, I gave a short (5 to 10 minute) introduction to the session, during which the kids showed a lot of interest in the subject. Then we started the hands-on part. It was wonderful to see the kids helping each other and working as teams to set up the best experiments they could! The kids carefully followed their protocol and shared the tasks among group members. Each group managed to set up their experiments within 15 minutes, and all the kids were quite curious about what would happen next. Like true little scientists, the kids cleaned up their benches before returning to their desks! 🙂 They then sat to watch a video on how gas is produced in the large intestine, and I talked to them about what a hypothesis is and why replicates are important in experiments. They were quite pleased to find out what makes their farts stinky – sulfur. One of the boys said he knew why his Dad’s farts smelled so bad: he must produce a lot of sulfur because he eats lots of eggs! While the kids learned the theory behind farts, their experiments were left to incubate. A video explained why some farts smell while most don’t. I then talked to the kids about the hypothesis for our experiments, and asked them which balloon they thought would have most gas in it based on what we’d learned about how gut microbes produce gas from the food they eat. After going through the theory and leaving the experiments to incubate for 15 minutes, everyone went back to their experiments, excited to see their results! The kids carefully measured the height of each balloon and recorded their results on a graph. The results of the experiments showed that gut microbes produce most gas when they have a carbohydrate source (sugar) and warmth, conditions similar to those found in our large intestine. Much to the team members’ delight, the yellow team (group 2) had the balloon with the most gas at the end of the experiment. When I (Marine) knew that I was going to have to take care of the third session “Why do we fart?” and it was going to follow on from the session where the kids made edible poo, I seriously asked myself how it would be possible to make my session as enjoyable and interesting for the kids as the previous week’s. 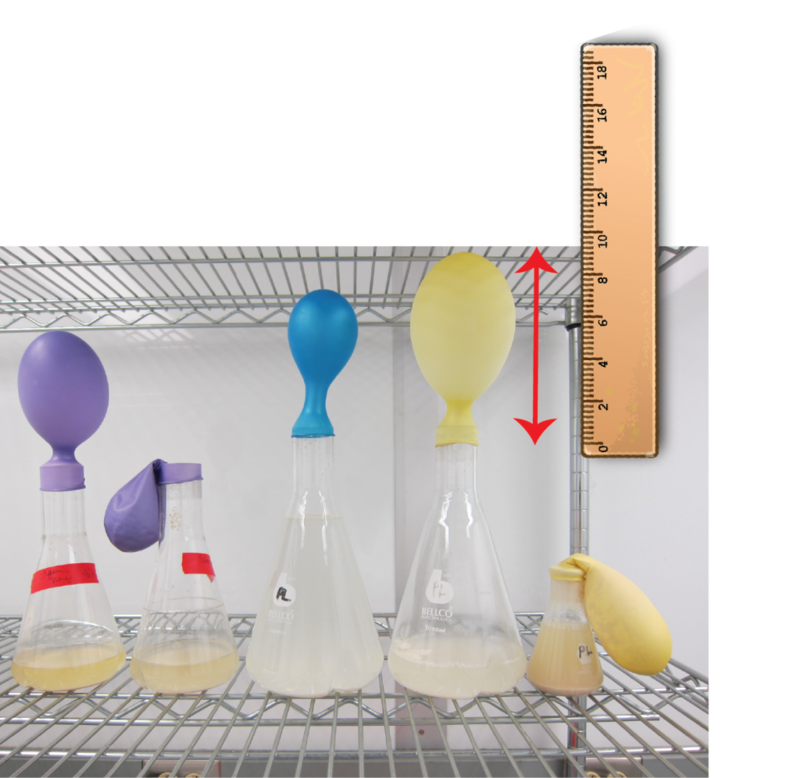 My idea formed relatively quickly: some yeast (representing the gut microbiota), some sugar or flour (representing the different foods we eat), and some warm water in a flask, all topped off with a balloon. I knew fermentation of the sugar by the yeast in the flask would produce gases (farts!) and make the balloon inflate. And in my mind I could definitely see the kids enjoying the role of mini chemist and having fun with the inflating balloons, wondering whether they would explode at some point! Combining food (sugar or flour), gut microbes (baker’s yeast) and water in a flask (the intestines) would mimic the way gut microbes produce gases responsible for flatulence. I prepared my session by looking at some experiments posted on the Internet, and adapting what I found. 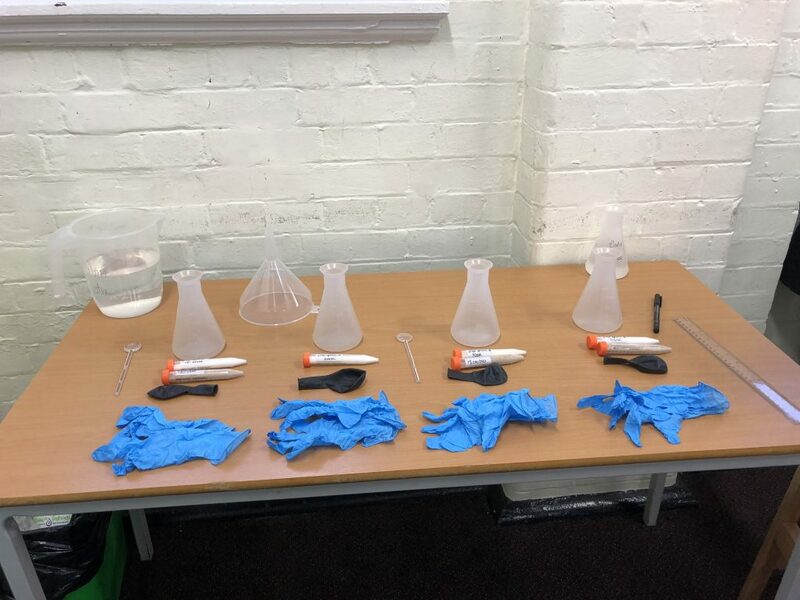 Initially, the experiment I designed involved seven flasks per group of four students and was quite complex. However, following the first session, run by Holly and Grace, I realised I was being ambitious in what could be achieved in one hour, so I simplified the experiment. I wanted the kids to remember the main take-home messages of the session – that gut bugs make us fart, and they need food and warmth to do this. I had two practice runs prior the session, to adjust the quantities of ingredients needed for the experiment and to ensure the required results would be achievable within one hour. Each group of four students would set up four flasks to determine what makes us fart. The first flask would contain warm (37 °C) water, sugar and gut microbes. The second would contain warm water and sugar but no gut microbes. The third would contain warm water, flour and gut microbes. The fourth would contain cold tap water, sugar and gut microbes. The kids would then put a balloon on top of each flask to capture gas produced. They would then be asked to predict what would happen in each tube during a 15-20 minute incubation. Before the hands-on part of the session, I planned to give the kids a brief explanation about what flatulence is and why we fart, so they could understand what we were trying to do with our experiments. After the kids had set up their experiments, I wanted to take the opportunity to introduce them to the concepts of a hypothesis, variability and replicates. By discussing with the kids what would they thought would happen, I thought it would give them a better understanding of how gut microbes make us fart. The students would be split into three groups, each of them doing the same set of four experiments. This would allow them to compare their results, and understand variability and why repeating an experiment and taking mean results is more accurate than doing an experiment only once. They would also learn how to analyse and report their results. At the end of the incubation, the kids in each group would measure the height of each of their balloons and record the results. They would then compare their results with those from the other two groups, and discuss the differences in results between each flask and each group. The big day finally arrived and Grace and I were armed with fancy thinking hats and sparkle. We arrived 30 minutes before the session to get set up, i.e. load the quiz and divvy out the organs. At the last minute (and to save time) we decided to draw around ourselves for the pin the organ on the body game… I’m not sure we anticipated looking quite like crime-scene bodies but at least we could distinguish between our outlines with the addition of my glasses! Pin the organ preparations. I’m not sure who was in charge of Grace’s legs (I think it was me – sorry!). At 3.30 pm the children arrived and we were off! Each child was given a lab book, something they could take away with them at the end of our 5 weeks together. The children were quite puzzled by the organs on the tables and really loved the lab books. After introducing ourselves and letting the children introduce themselves, we asked them to come up with team names and to bring their laminated organs down to the floor. Getting down on the floor with the children to complete the pin the organ game turned out to be a really good ice-breaker and provided us with a lot of entertainment. One girl was convinced the appendix was a little eyebrow (complete with demonstration! ), and other members of the group thought the liver was the heart or a lung. Unsurprisingly the mouth was the only correctly placed organ! In hindsight, we should have shown the children a picture of a correctly labelled diagram demonstrating how the gastrointestinal system fits in the human body before asking them to figure out where the laminated organs were supposed to go! We definitely threw them in at the deep end, although they still managed to do a great job! Grace (left image), Holly (right image) and the children build the digestive system. 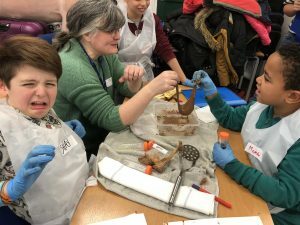 After showing the children where the organs went we tested their knowledge on digestion, microbes, bile and metabolism. The term microbes threw them a little. We asked them how many microbes they thought lived inside us: one boy thought there was only one! The expression on their faces when we told them there were millions was priceless! 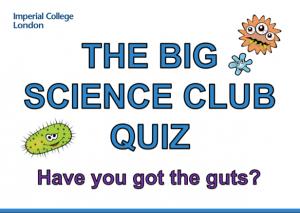 After giving the children a little bit of background knowledge, we started the ‘Big Science Club Quiz’. The children were great at passing along our jazzy ‘thinking hats’ so that a different child from each team was wearing it for each quiz question. The child wearing the ‘thinking hat’ became the team leader, and had to communicate with other team members, shout out the answer on behalf of their team and then stand in front of the class and read our ‘fun fact’ if their answer was correct. This meant that every child, particularly those who were sometimes overpowered by louder, more confident class members, could get involved and had their chance to speak and be listened to. It was lovely to see the children get so passionately involved and I think the friendly competition between them sparked even more enthusiasm. The children loved the Big Science Club Quiz, complete with thinking hats and the Science Club pink rainbow unicorn (it really is a unicorn!). With all the shouting, excitement and laughter the hour session went a lot quicker than anticipated. We were initially worried about timings but soon realised that sometimes you can’t do everything and that’s okay. As Niamh put it so eloquently in a thank you email: “… the MOST important thing is that everyone is having fun (you and the children), where there is fun and laughter, there is learning.” We certainly had a lot of fun and learnt a lot, and have plenty to think about for the next outing of the science club. Grace and I offered our services to take charge of the first science club session. We opted for a ‘go-big or go home’ attitude – which to us meant glitter, a bucket-load of enthusiasm and jazz hands. 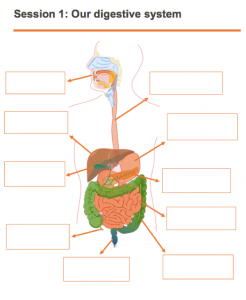 Our first idea of introducing the gastrointestinal (GI) system to the children was to get them to try our own version of pin the tail on the donkey…pin the organ on the body, obviously. This would involve the children being given a set of laminated organs with the aim of identifying where they went on a life-size body. Lesley suggested that we could make this more interactive by getting the children to draw around one of us! Following this ice-breaker, we wanted to then split the children up into two teams so we could see how much they actually knew about the GI system. We had bounced around a couple of ideas about how to do this but after meeting with Niamh, she thought it would be even more exciting for the children to get involved in a “big quiz of the year”. 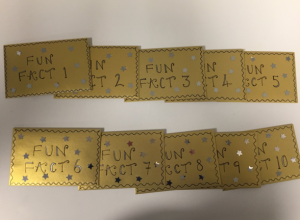 This sparked a rapid trail of thoughts that led to us creating “thinking caps” and golden ticket style envelopes with fun facts in. We wanted to introduce the concept of a thinking hat to 1) ensure only one member from each quiz team could talk and 2) restore some form of order to a group of 9 and 10 year olds. With our ideas pretty set in stone Grace and I had to think about getting prepped! We thought 10 questions (and 10 organs) would be an appropriate length for a children’s quiz. One evening when we were tackling the drawing and cutting of our organs we realised we’d forgotten to include the stomach as an answer (no biggie just one of the most important parts!!). 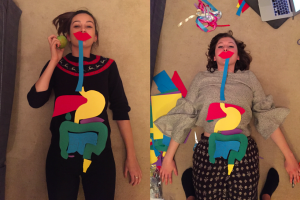 By 11pm that same evening we thought it would be wise to check whether our organs were actually life size…as you can see we were very successful – take that GCSE art! In light of Niamh’s suggestions, we also made the quiz more competitive by pairing each answer with a fun fact. The fun fact will be read to the class by a member of the team that gave the winning answer. Deciding what to include in these fun facts was a lot trickier than either of us thought and involved a lot of “fun facts about…” googling and reading the children’s school syllabus to try and think of something age-appropriate. My favourite fact was about the small intestine being 6 metres long and the large intestine only being a metre – Grace and I knew this would impress the children. It was important to both of us that the children did a small task at the end of the hour to help them consolidate what they’d learnt from us. We designed a worksheet (see below) that would prompt them to think about the first activity (pin the organ on the body) and the quiz. With all of this, we are finally ready to meet the crowds! Wish us luck!! Last week, the PhD students and I visited Primrose Hill Primary School. It was an opportunity for Kiana, Marine, Grace, Jerusa and Holly to meet Niamh Keating for the first time, and for us all to see how children are being taught science at school. We spent half an hour in a class with year 5 children who were studying gravity. They put us to shame with their knowledge of the difference between air resistance and friction! It was great to see how enthusiastic all the children were to share with us what they had learnt, and how they were designing experiments to test various concepts associated with gravity. After our class time, we sat with Niamh and went through the various activities the PhD students have planned for the first few weeks of the science club. Niamh was really impressed by the enthusiasm and commitment the students have for the club, and how they have taken real ownership of it. She gave useful guidance on how activities could be modified to work with year 5 and 6 children, and suggested we changed the week 4 session to allow the children time to prepare items for their week 5 show-and-tell session with their parents. 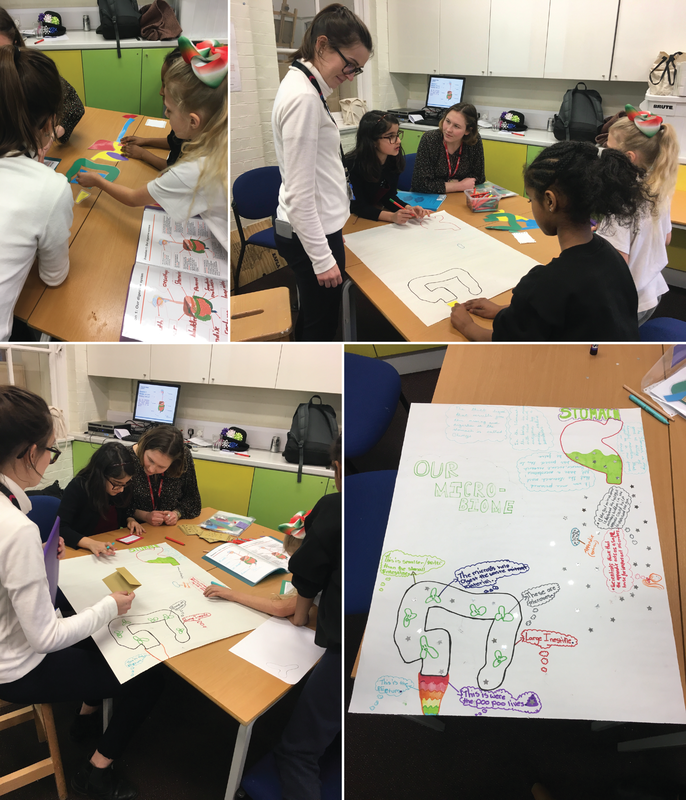 We now have a plan… Week 1: introduction to the body, its organs and bacteria with Holly and Grace, who are going to run the session as a game show (I’ve heard glitter mentioned more than once!). 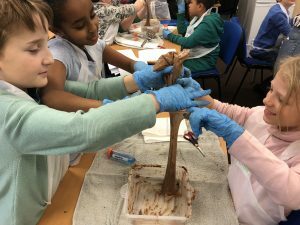 Week 2: digestion with Jerusa and Kiana, who are going to illustrate the whole process with a hands-on activity that involves making edible poo. 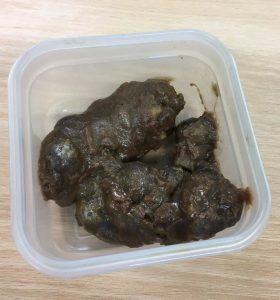 Kiana excelled herself in making her cocoa-based edible poo look real. Only she could bring herself to sample her creation! Week 3: Marine is going to teach the children all about farting, with the power of baker’s yeast, sugar, balloons and warm water. It’s going to be fun, and is the session Niamh and I are most excited about (we are 12!). Week 4: the children will prepare posters, videos and props to show their parents what they’ve learnt in their time with us. 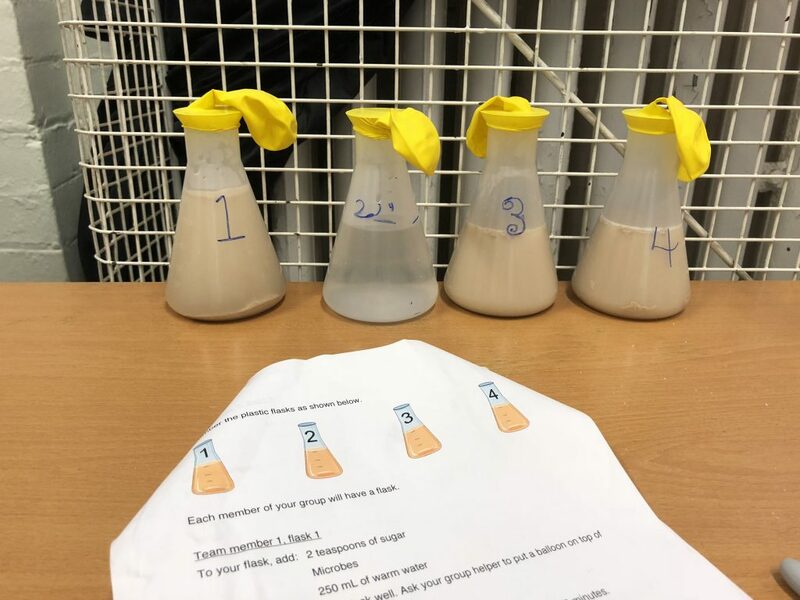 Week 5: show-and-tell, which will be a great opportunity to get feedback from the children as to how we can improve the science club for its next outing. 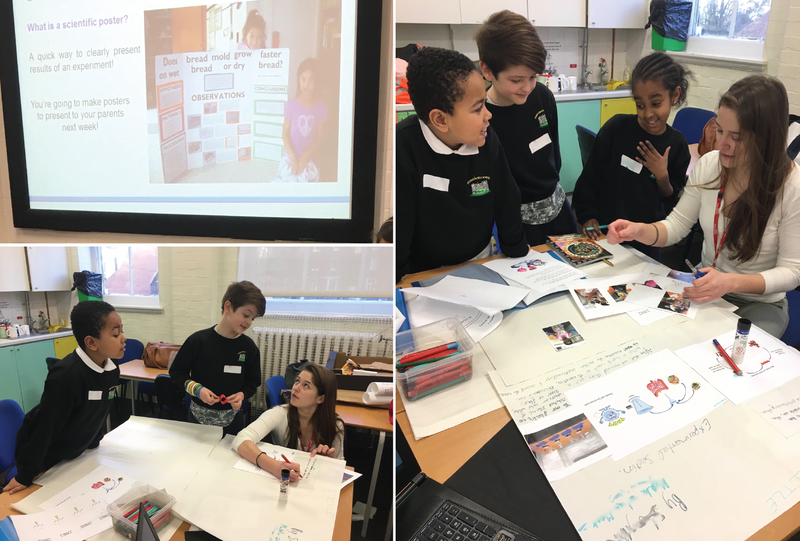 We plan to document the development of the various activities we’ve been working on, and will be sharing our teaching resources with the public via this blog in the coming months. 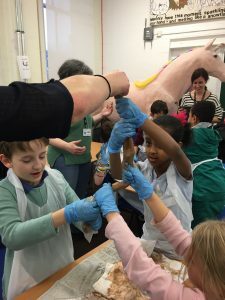 The idea of the after-school science club came from a conversation I had with Niamh Keating, Reception Teacher and Leader of Learning for STEAM at Primrose Hill Primary School after I’d attended a meeting of Camden-based science teachers at the Wellcome Trust. 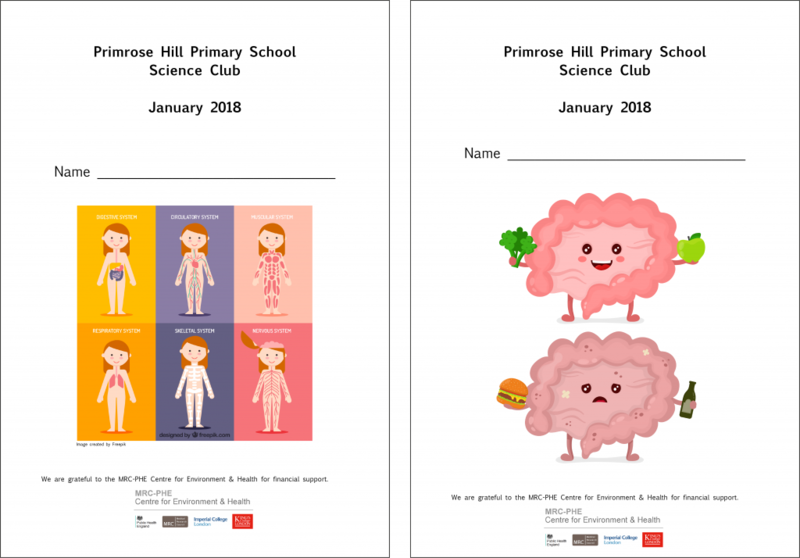 I was keen to go into schools to teach kids about gut health and the microbiome, while Niamh wanted her year 4 and 5 students to be exposed to science that would build upon what they had been learning as part of the core curriculum. 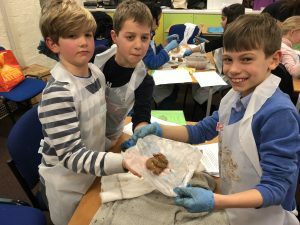 We both thought it would be a good idea to set up an after-school science club, as this would allow us to explore a topic in more depth than a one-off STEM activity. I couldn’t manage this undertaking on my own, so I asked PhD students working within the Department of Surgery and Cancer, and the wider Faculty of Medicine if they were interested in getting involved in developing outreach activities. Five intrepid volunteers took up the challenge, and you’ll be reading posts from them in the coming months. The great thing about setting up an after-school club from scratch is the PhD students get a real insight into how much time and effort (a lot!) goes into preparing classroom-based activities, they have an opportunity to share their knowledge with a non-expert and enthusiastic audience, and they get teaching experience in a friendly environment. It’ll be as much of a learning experience for them as it will be for the kids at Primrose Hill, and the experience and knowledge the PhD students gain over the coming months will allow them to work towards Higher Education Academy Fellowships, demonstrating their professionalism and commitment in learning and teaching.